When you think of tech giants, what companies come to mind? Apple, Amazon, Google/Alphabet, Facebook…how about Microsoft?? We haven’t discussed Microsoft much in this class at all. I don’t recall Microsoft coming up once in our weekly 30 minute tech news discussions. Why is this? Have they not been innovative recently? Why have we been having conversations about all the other technology behemoths, but not Microsoft? This blog post is designed to investigate why Microsoft hasn’t been being discussed, even though the giant is currently the 4th biggest company by market capitalization, valued at $724.24 BILLION. 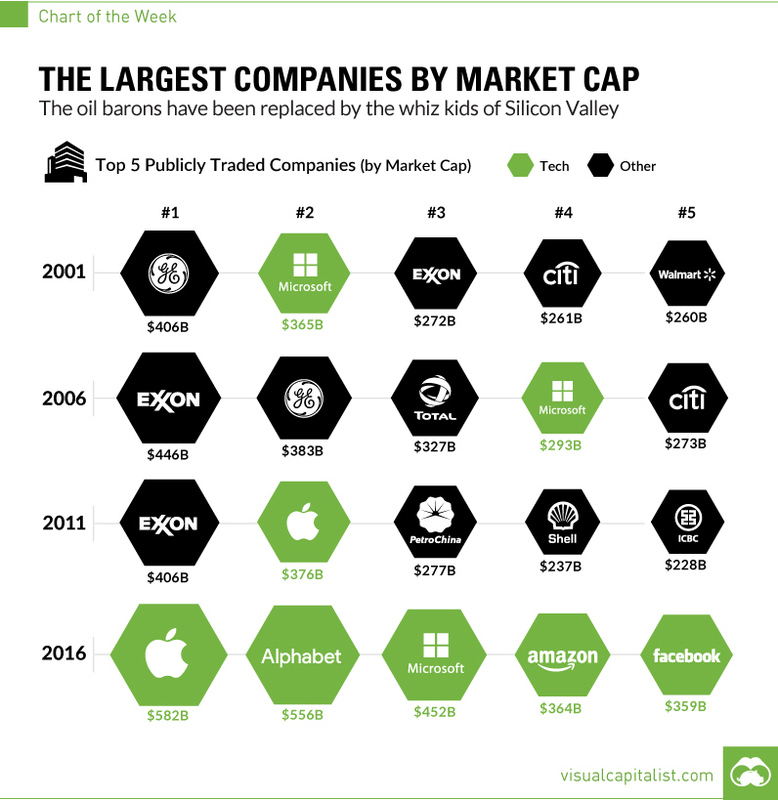 Let’s take a look at the current landscape of giant companies. Of course, first there is Apple, arguably the most successful company in history with their exclusive digital ecosystem of related high-quality products. After Apple is Alphabet, the conglomerate owning a bunch of innovation and Sundar Pichai’s Google. Next comes Amazon, the company who recently surpassed Microsoft in value and who never fails to make headlines each and every week with news about partnerships, acquisitions, strategy changes, and new features. After is Microsoft, which I will discuss throughout this post. At 5 is Facebook, Zuckerberg’s social media website. And Microsoft has shown continual growth in terms of financial performance. In 2016, Microsoft was the 3rd largest company by market capitalization, valued at $452 billion – now that number has surpassed $700 billion! All these companies deserve to be talked about: so let’s talk Microsoft! Microsoft was founded by childhood friends Paul Allen and William Gates about 43 years ago on April 4, 1975. They decided on the name “Micro-Soft” since it combined MICROprocessors and SOFTware. Paul Allen quit his job as a programmer for a Boston-based company, and Bill Gates dropped out of Harvard to focus on running their new company together. Beginning as simply a software company in Albuquerque, New Mexico, the company moved to Bellevue, Washington in 1979: the suburb of Seattle where both Gates and Allen grew up together (the firm’s headquarters is currently located in Redmond, Washington). By the beginning of 1979, the company had already surpassed $1 million in sales. Microsoft first hit headlines with a bang in 1981 when it partnered with IBM. At the time, IBM was a force to be reckoned with, and was the second most valuable company behind AT&T (wow have the times changed), so this deal was huge news. IBM introduced its personal computer that would use Microsoft’s DOS as its operating system! Defined, an operating system (OS) is “the basic software that supports a computer’s basic functions”. After working with a name with the brand power of IBM, other companies rushed to license Microsoft’s DOS product. Unfortunately, in 1983 Paul Allen had to leave Microsoft, leaving Gates on his own to run the company. Allen was diagnosed with Hodgkin’s lymphoma, which called for emergency treatment. Luckily, the treatment was successful, and after making a recovery, Allen pursued a variety of other business ventures. Windows 1 came into existence in 1985, and the company has built better versions of Windows throughout its history. A key strategic advantage to using Windows 1 operating system at the time was the product’s graphical user interface, whose features including scroll bars and drop-down menus, creating an unmatched ease of use. Windows 10 is the latest version of the product, released in 2015. After the success of launching Windows, Gates decided that it was a good time for an IPO. In 1986, Microsoft went public at $21 a share, raising $61 million in investment. A year later, Gates became the world’s youngest billionaire at 31 years old. The company’s innovative reputation was highlighted in 1988 with the release of Access Utility for Windows 2.0. This “accessibility support program” was designed to improve and enhance Windows’ accessibility for people who either are deaf, have hearing issues, or have limited dexterity. Access allowed alterations in the keyboard and mouse, gave the users visual alerts for computer sounds, and allowed the computer to be operated through other devices hooked to the serial port. This move set up the company with a great reputation and a dedication to accessibility for all in each of its business endeavors. Microsoft hasn’t faced much legal trouble in its history, but the firm’s first issue came in 1998, when the US Department of Justice charged Microsoft with violations of anti-trust laws. Microsoft was accused of “using its dominance to drive competitors out of business”. The government and Microsoft eventually reached a settlement, which included restrictions on the company’s regular business practices. As you can see, Microsoft was poised to become a giant from the start, and the company did just that! CEO Satya Nadella is currently running the company, and he succeeded Steve Ballmer (who ran the company for 14 years) in 2014. Now lets take a look at the firm’s current core products. Windows was an important product for Microsoft since the beginning. The latest version of Windows is Windows 10, which received great reviews! Windows 10 features a smart menu, the Edge browser, the AI assistant Cortana, and many new applications. The latest version also includes better drawing capabilities with Surface Tablets and new tools for 3D and gaming. This OS is featured on almost all laptops and PCs not Apple, and its main competitor is Apple’s iOS, which is run exclusively on Apple products. Office is a suite of programs, and I’m willing to take a bet and say that we all have used one of these at least once in our lives: Word, Excel, PowerPoint, Access, Outlook, OneNote, Publisher, and Access. I’m almost positive we are all familiar with the first three. Access is a “database management system (DBMS) that includes the relational Microsoft Jet Database Engine with a graphical user interface and software development tools.” Outlook in itself is a suite that includes webmail, contacts, tasks, and calendar and scheduling capabilities. Some companies use Outlook as their main source of communication. That was the case for the small company I worked for at my previous internship. OneNote is a program for gathering information which has multi-user collaboration features. It is capable of gathering notes, drawings, screen clippings and audio commentaries for its users. And finally, Microsoft Publisher is a publishing application which differentiates itself from Microsoft Word through its emphasis on design and page layout rather than text composition. One can easily create and customize business cards, greeting cards, calendars, newsletters, and a lot more with Publisher! Microsoft does a great job regularly updating this suite of software with new capabilities and features guaranteed for each service. Office only has to worry about Google Drive, which is free and focuses on multi-user collaboration as its value proposition. According to venturebeat.com, Sony’s PS4 currently has 57% of the market compared to Xbox’s 41% market share. But the Xbox One X is definitely off to a good start, and Microsoft hopes that this new console will help to gain some more market share away from Sony to the Xbox. This product line along with Office and Azure Cloud bring in the most cash for Microsoft! The surface product series was officially launched by Microsoft in 2013 when it announced the Surface 1 and 2. The original value proposition of the Surface was a high quality device that could be used as both a laptop and a tablet. These touch-screen personal computer devices developed over the years and now include tablets, hybrid products between tablets and laptops, desktops, notebooks, and even an interactive whiteboard! I found the Surface Studio‘s differentiation factor quite interesting: Microsoft said that the desktop has been designed for creative individuals, and has many high-quality artistic capabilities, such as visual design and music recording. Most of these devices come with a stylus, which is also pretty unique. Microsoft has a bunch of competitors in this industry of computing devices, and the firm hasn’t been successful in attracting a large market share. The Surface products saw stagnant sales numbers – in 2017, the products raked in about $1.3 billion in sales for Microsoft. Hearing that figure alone sounds good, but for Microsoft, it wasn’t, especially since they released three new surface products in 2017 and saw approximately the same sales numbers the previous year in 2016. The Surface Book 2, the firm’s latest laptop, brought in the best numbers out of all the Surface products in 2017! Bing is a search engine that is very comparable to Google’s search engine. It works the same way, and brings revenue into Microsoft through advertising. Personally, I find Google’s search always brings me better answers, and I feel as if a lot of people feel the same way. Currently, Google controls 70% of the search engine market, followed by Baidu at 14.5% and Bing at 8.5%. Internet Explorer and the new Microsoft Edge are the company’s browsers, which work best with Windows 10. A browser is defined as “a program with a graphical user interface for displaying HTML files, used to navigate the World Wide Web”. Again, in the browser industry, Microsoft is losing badly to Google. Chrome controls 61%, followed by Internet Explorer with 12%, Firefox with 11%, and Edge with 5%. I had never even heard of Azure before doing this research, but as it turns out, the service is a big player that we should all be aware of! Azure is Microsoft’s cloud computing service in which companies can “build, test, deploy, and manage applications” through a world-wide network of Microsoft data storage centers. According to Microsoft’s website, startups, government agencies, and 90% of Fortune 500 companies utilize Azure. Microsoft also implements Artificial Intelligence in these services, empowering companies to create intelligent applications with powerful data through built-in data analytics tools. Azure’s services prove to be one of the most profitable and cash-attracting business lines at Microsoft! Amazon Web Services (AWS) and Azure are the largest players in this market. However, AWS has been growing exponentially and is currently dominating the cloud computing industry with a 47.1% market share. Azure is at 10%, while Google Cloud lies in third place at around 4%. Microsoft incurred a $13.8 billion one-time accounting charge related to the tax reform bill. Fueled by the release of the Xbox One X, gaming revenue was up 8%. Microsoft’s largest business segment named “More Personal Computing“, which encompasses Windows, devices, and gaming & search advertisement, grew 2% with $12.17 billion in revenue. Azure had 98% revenue growth in the quarter, with usage of the service more than doubling! The Productivity and Business Processes segment, which combines Office and LinkedIn, saw a revenue of $8.95 billion, increasing by 25% from last quarter. On February 23, Microsoft announced a partnership with Chinese technology giant Xiaomi. The 2 well-known firms are teaming up “in a close collaboration on cloud computing, artificial intelligence, and hardware”. Through the partnership, Xiaomi is now allowed to use Microsoft’s Azure cloud computing services for its variety of devices, including mobile phones and computers. In return, Microsoft will have more access to the Chinese market! The stock market responded in an agreeable manner, sending Microsoft’s stock rising. I think this is an excellent deal for Microsoft! Many US technology companies, like Apple, have difficulty competing with the likes of Lenovo, Huawei, and Xiaomi in the Chinese technology consumer products market. This partnership could really raise Microsoft’s revenue a significant amount and put itself in a better place in Asia than its competitors. The deal also enhances the firm’s position in researching & developing very important technologies in the business world, like AI and cloud computing! As seen throughout its history, Microsoft is committed to accessibility, and the company truly wants to ensure that anyone, no matter what disabilities a person may have, can use the firm’s devices. On February 22 of this year, Microsoft announced a collaboration with Be My Eyes in order to give better tech support to the blind. Be My Eyes is an application providing a form of assistance to the blind and to the low vision community. This partnership hopes to give live video connection, company representatives, and volunteers to help these visually-disabled people perform normal tasks like cooking and finding lost items! This deal is definitely a check for Microsoft’s corporate social responsibility and reputation! Microsoft and Google have a long history of intense rivalry, in particular over security issues. This harsh relationship continued when Google on February 19 announced a security flaw before a patch was available in Microsoft’s browser, Edge. Google found the problem in November, and gave Microsoft 90 days to fix it. Google also gave Microsoft a 14-day grace period as extra time to fix the flaw. Microsoft responded that “the fix is more complex than initially anticipated”. It is unclear at this point when Microsoft will have a solution. This move will likely anger Microsoft, who called Google out for an issue in Chrome in October of 2017. Google has been urging the tech industry to follow its aggressive disclosure policies, and Microsoft has resisted this idea publicly. As a side note, I recently tried Microsoft Edge and was pretty impressed with its improved speed! I highly recommend giving it a shot to see how you like it (after news of the fix, of course). I noticed that Edge was more efficient in updating my open social media pages like LinkedIn and Facebook. I may be switching soon as a habitual user of Google Chrome to Edge! I found this article due to @kippmilone‘s reply to my tweet about Edge, so I figured I would give him a shout out – thank you for that! Something very important and relevant to keep in mind on our trip is that Microsoft acquired LinkedIn (beating Salesforce to it) in November of 2016 for $26.2 billion. The two companies remained independent in some aspects, and closely collaborated on other factors. This deal really enhanced Microsoft’s position in the open-ended social networking game! LinkedIn then became a part of the Productivity and Business Processes segment of Microsoft. If you feel you don’t know enough about LinkedIn, @mkrameisen had an awesome post all about it! We may be visiting the professional networking site on our trip, but our visit is currently up in the air and not finalized. I don’t really know why Microsoft hasn’t come up much in conversation. I know that we won’t be visiting Microsoft on our trip, but the firm is an extremely essential entity to think about, since it directly competes (and maybe even collaborates) with many of the companies that we will visit. I hope that this post got you informed about the company and up-to-date with what’s going on at Microsoft! I actually had a similar thought the other day as to why we hadn’t talked about Microsoft. A lot of tech publications I’ve seen recently typically reference Google (or Alphabet), Apple, Amazon, and Facebook as the “Big 4” in tech, but that is obviously not the case with Microsoft really being right up there with them. I do, however, blame most of it on Microsoft’s inability to innovate. Bing has little to no advantages over Google, Internet Explorer failed to adapt and lost a huge market share it once held, and similarly the Xbox One has greatly fallen behind the PS4 when the previous generations consoles saw Xbox with an equal market share. It makes me wonder if Microsoft may be spreading itself too thin. Great post! Incredible post, Dan! I didn’t realize we did not talk about Microsoft at all until this post! For someone like me who is immersed in the Apple eco-system, I still interact with Google products every day–Gmail, Chrome, the Drive suite, map, but I don’t use Microsoft product as much. Sometimes word and excel but often I turn to the google drive. I feel Microsoft’s ecosystem is somewhat closed too but its presence in mobile devices is not as ubiquitous as Google. Thanks for the shout out Dan! Microsoft’s acquisition of LinkedIn was huge, as there were four 4 other companies trying to as well including Alphabet, Oracle, Facebook, and IBM. I enjoyed seeing the picture you included of their revenues split up by segment. It made it clear to see what makes up each segment, and I found it interesting to see the growth in the More Personal Computing category as well as find out that it is their largest segment. Microsoft is large and increasing its revenue but I am curious as to what will happen to the Microsoft Office Suite and Bing in the future, with Google Drive and Google Search being so large. Awesome post, I’m happy you touched on a company we haven’t looked at in depth yet. Maybe this should be a #D for our next class. I didn’t know that Microsoft made their own Database Management System, so I looked up a quick review to see what separated it from Oracle, and apparently Microsoft Access is NOT an industry favorite (link: https://stackoverflow.com/questions/1170168/what-are-the-differences-between-access-and-oracle). This said, Microsoft is still a beast of a company! Lizzy, I had no idea either! I know we’re both in Database Systems & Applications right now, so I was really surprised to hear that Microsoft offers a RDBMS! That article is a great read, and clearly Oracle has the lead in this industry – learning SQL is pretty fun too! Thanks for some the extra insight on that topic. Hey Dan, great post! I think we should all admire Microsoft for their stability and longevity in the tech industry! They have released great, consistent products through the entire lifespan of the company. Windows is definitely the king OS in most countries today and I think that will definitely continue for a long time. I think it is really important that you mentioned Microsoft Azure in this post since I hear many great things about it even though AWS is overshadowing them. Amazon is pursuing so many projects at once that AWS may eventually lag behind Azure if they find another hit like AWS. Granted, it seems like Amazon is investing a lot of time and money into AWS, but only time will tell what happens. Wow. What an amazing post! We spend so much time thinking about the “newer” tech companies that we often forget about Microsoft, which is still a behemoth in its own right. If it can ever get its culture straightened out, it could be a major contender. This was amazing, Dan! It is funny because Microsoft is such a tech giant, yet an old tech giant. I think in the back of our minds, it is always there, yet there seem to be more exciting things to learn and research about. Your post proved that wrong, though! I really enjoyed your explanation of Azure. I had never heard of it either before this post and the fact that governments, startups, and 90% of Fortune 500 companies utilize it is jaw-dropping to me. I wonder what it will take for Azure to possibly catch up to AWS. I think if it figures out a way to leverage its already massive scope of customers with Windows 10 and Microsoft Office by creating high switching costs, it could create more of an ecosystem in the cloud world – especially since it seems as though AWS has not quite done this yet either. This is an incredibly informational and well written post! I learned so much…where to begin?! To start, I did not know the emphasis Microsoft has continually put on accessibility and I now appreciate the company more for it! I always forget how expansive Microsoft is and how much territory they cover as a company. I remember how big the Xbox One was when it came out, but I had no idea about the release of Xbox One X and its immense success! It’s shocking that it is still second to Sony’s PS4, but I’m sure it won’t be for long. I am curious about Microsoft’s company culture. Because it’s an older company, there wasn’t as much buzz about the importance of company culture during their founding. How has culture played a role in the company’s history? What about their future and how do they see the implementation of a company culture to look like? Just a few questions I would like to ask them if I got the chance. Thanks for writing this, Dan!